This article by John Megoran is reproduced with permission from the Paddle Steamer Kingswear Castle Trust website. It is the latest of his regular 'Pictures of the Month' features that appear on the Trust's website here. Also note that John will present his illustrated talk on Kingswear Castle at the next PSPS Scottish Branch meeting on Friday 21st February. More details here. 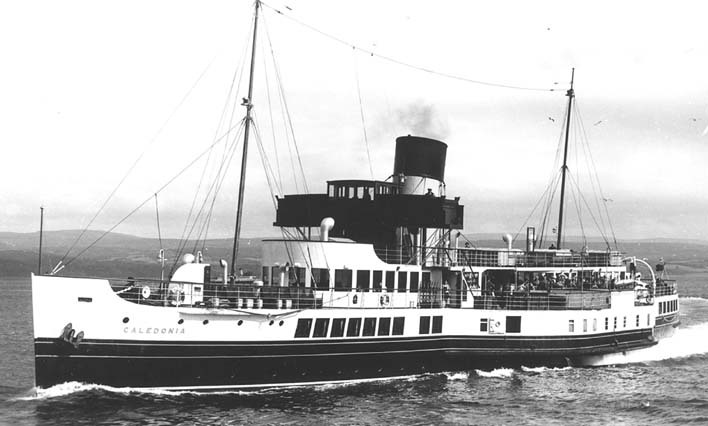 Fifty summers ago, in 1964, there were still four paddle steamers operating on the Clyde, the Jeanie Deans, (pictured above) Waverley, Caledonia and Talisman. 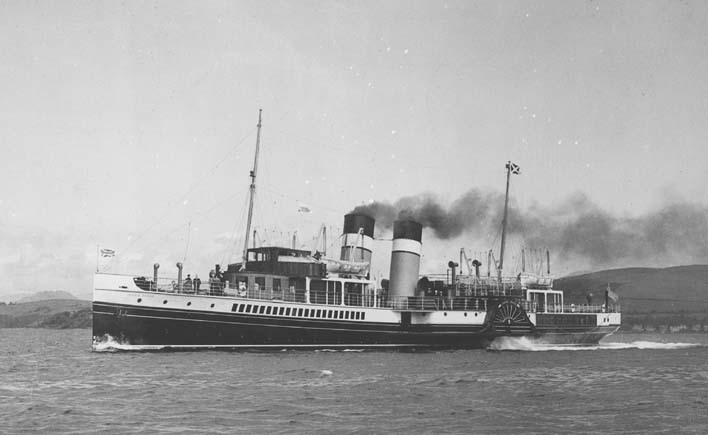 Built in 1931, the Jeanie Deans was designed primarily for the LNER route from Craigedoran to Arrochar although she did spend much of the 1930s on longer services to lower parts of the Clyde. After the war she was given a major rebuild in which guise she can be seen in this 1947 picture. 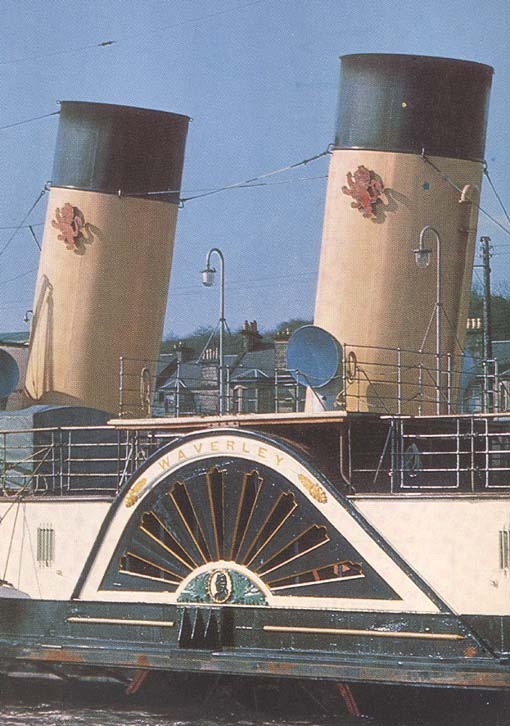 This final design was used as the basic template for the slightly smaller paddle steamer Waverley of 1947 pictured here alongside the King George V in the Albert Harbour at Greenock in October 1965. With food rationing still in force and materials of all kinds in short supply, building a new passenger steamer of any quality just after the war in a climate of austerity was easier said than done and there were those who felt that the new Waverley was not quite the equal of the paddle steamer on which she was based. 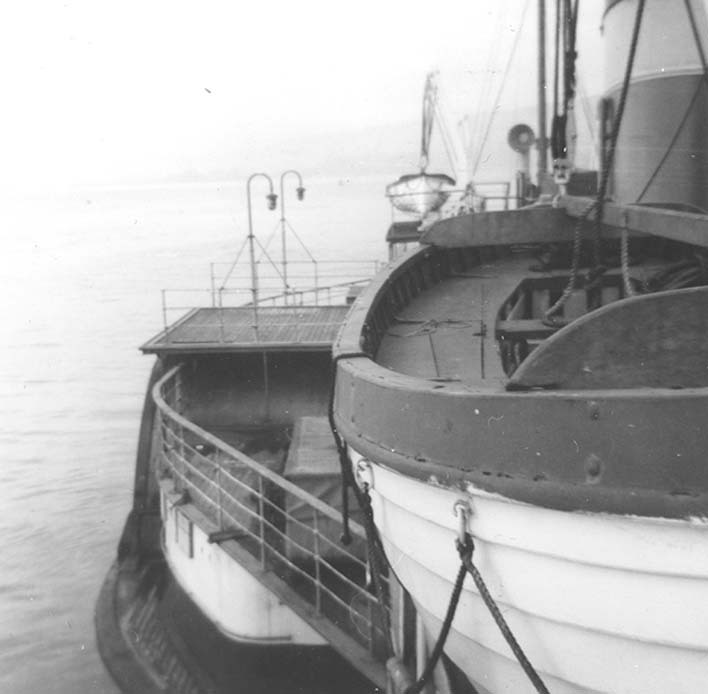 The new ship was given a slightly more modern profile than the Jeanie Deans including a raked bow and a cruiser stern (which may also have been slightly cheaper to build than the more traditional straight stem and counter stern) and sat lower in the water giving her less freeboard under the sponsons. She also turned out to have less favourable handling characteristics than many paddle steamers with a distinct tendency to back up into the wind when steaming astern even in moderate weather conditions and a marked propensity for the bow to fall in on piers whilst berthing. 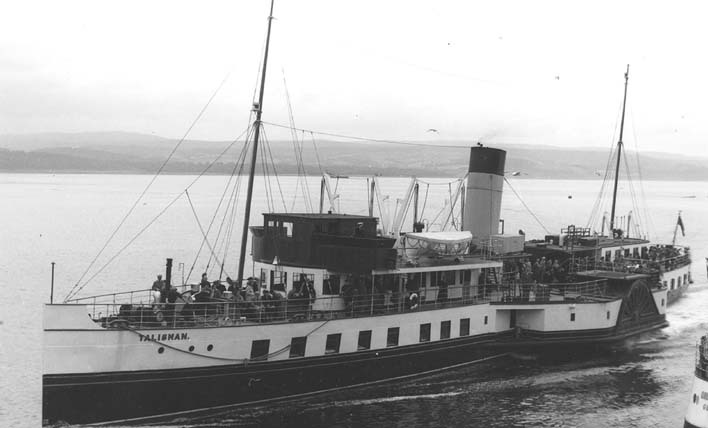 It was therefore the Caledonia, built in 1934, with her better construction, better handling characteristics and more sea-going abilities, and not the newest paddle steamer in the fleet the Waverley, which was the preferred Ayr based excursion steamer for sailings in the lower Clyde and to sea. The Diesel-electric paddler Talisman, built in 1935, was the ferry workhorse and spent pretty much the whole 1964 summer running backwards and forwards on the Wemyss Bay to Millport ferry service, out and back and out and back and out and back again, over and over and over, day in and day out. 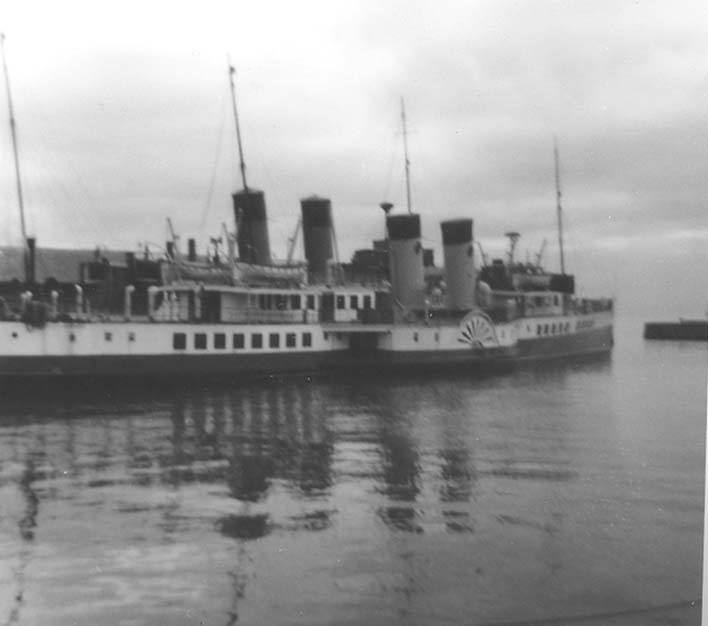 After slipping at Lamonts Shipyard at Port Glasgow in March 1964 the Jeanie Deans emerged in April with only a six month extension to her Passenger Certificates and the news that as little money as possible had been spent on her as, along with the large turbine Duchess of Montrose, she was to be withdrawn at the end of the season. Clyde excursion sailings were to be reduced and Ayr all but abandoned from 1965. Nevertheless, she still had one more Clyde season to go and this she started on 9th May with around 400 passengers joining her for a Scottish Locomotive Preservation Fund charter which was to have run from Craigendoran and Gourock to Ardrishaig but which ended up calling at Rothesay instead due to the strong winds. ...with her schedule in the peak weeks alternating week and week about with the Waverley. One week, after quiet mornings alongside, the Waverley would do the afternoon cruise, 12.40pm back 6.50pm, from Craigendoran through the Kyles of Bute and round Bute each day Sundays to Fridays whilst the Jeanie Deans ran the longer day trips to Brodick and cruise to Pladda on Mondays, to Lochgoilhead and Arrochar on Tuesdays and Thursdays, "Round the Lochs and Firth of Clyde" on Wednesdays and up river to Glasgow with time ashore on Fridays. The following week the two ships swapped over to balance up the crew overtime. On Saturdays they usually ran the ferry service to Rothesay either from Wemyss Bay or from Craigendoran. As the season wound down in September, the Jeanie Deans operated various ferry services as required and continued with some excursions making her last trip with passengers on Monday 28th September. The following morning she crossed to lay-up in the Albert Harbour at Greenock. 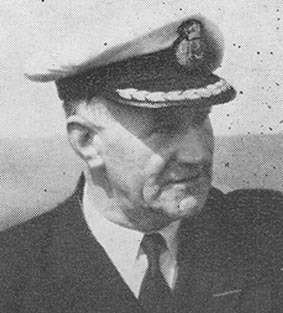 Her main master in 1964 was Captain Donald Crawford who transferred to her in 1963 after a decade as captain of the Maid of Argyll. He was relieved from time to time by Captains Angus McEachran, Alf Purvis, David McCormick and Donald McPherson. So that was the summer of 1964 on the Clyde. Four paddle steamers to enjoy as well as the multiplicity of motor vessels plus the three large turbines Duchess of Hamilton, Duchess of Montrose and Queen Mary II. A feast by any standard. For 1965 there would be one less paddle steamer with the Caledonia, now under the command of Captain Crawford, transferred to Craigendoran to replace the Jeanie Deans leaving Ayr with no summer based excursion paddle steamer. After languishing at Greenock for the whole winter and the following summer season of 1965 the Jeanie Deans was bought by Don Rose from London for a proposed new career sailing on the Thames and moved to Lamont's Shipyard where she was slipped and prepared for the voyage south (for more about this click here). This picture was taken from the starboard bridge wing on November 5th 1965 shortly before she left Greenock for good. 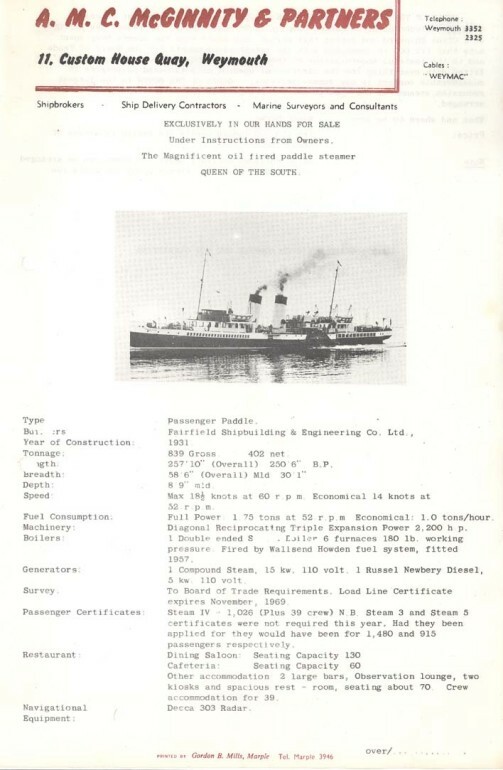 Sadly this new career under the name Queen of the South turned out to be rather less than successful with the ship sailing on only a handful of days in 1966 and 1967. She was then sold for scrap in Antwerp through shipbroker A M C McGinnity & Partners, the same Tony McGinnity now wearing a new nautical hat, who, as a young and enthusiastic PSPS Wessex Branch member, had bought the paddle steamer Consul with others and tried his hand at running her on the Sussex Coast and the Thames in 1963 and then in 1964 from Weymouth. 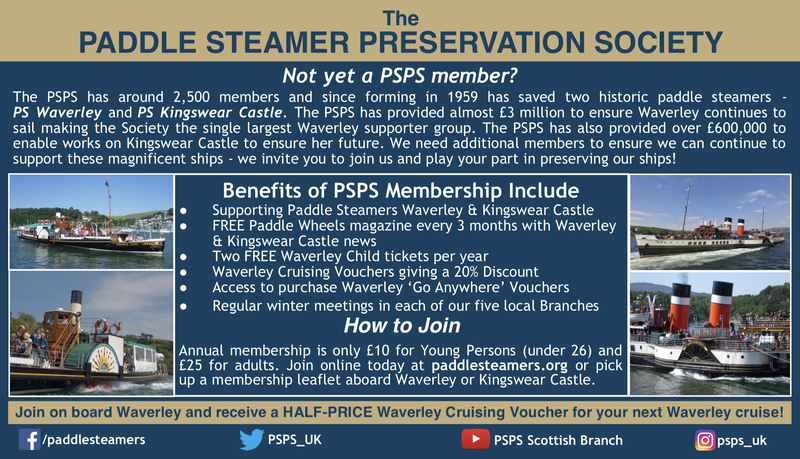 There are many common threads amongst people trying to save and run paddle steamers in the 1960s linking them back to the heart of the Wessex Branch of the PSPS then driven, sometimes at gale force, by the indomitable Mrs Eileen Pritchard, PSPS member number 001 and a formative influence upon many. 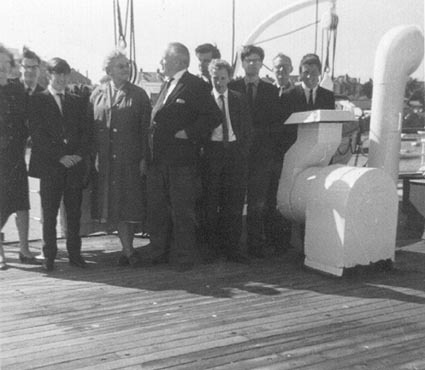 Here she is in this picture taken on the deck of the Princess Elizabeth in 1965, squaring up to Cdr Edmund Rhodes, the ship's owner, and in company, left to right, with Mrs Barclay-Bishop, Cdr Rhodes' lady friend and banker, Victor Gray, Richard Green, Lionel Poole, Richard Clammer, Geoffrey Pritchard, Eric Daniel and Peter Lamb. It was Mrs Pritchard's protege, Tony McGinnity, who persuaded Don Rose to buy the Jeanie Deans. It was Tony McGinnity who handled her final sale. It was Tony McGinnity who handled the sale and move to the Thames of the Caledonia to become a pub when her time was up in 1969. And it was Tony McGinnity who would subsequently take on a leading role in the management of P & A Campbell during their last decade on the Bristol Channel in the 1970s. Mrs Pritchard knew just about everyone associated with paddle steamers on the South Coast in the 1960s and was friends with many of them including Captains Defrates and Woods who were involved with the Consul and Princess Elizabeth and Edmund Rhodes and Herbert Jennings who owned the Princess Elizabeth and Freshwater respectively. It was from within her PSPS Wessex Branch that attempts to buy the Alumchine and the actual purchase of the Kingswear Castle originated. It was her Wessex Branch which helped to facilitate the Medway Queen's move to Binfield on the Isle of Wight and kept an eye on Kingswear Castle as the Riddett's let her deteriorate nearby. And it was her steel tipped finger which poked so many chests to make things happen and encourage those of all ages to do their bit to help paddle steamers. Younger PSPS members at the time were not exempt from Mrs Pritchard's powers of persuasion either and several teenagers from that Wessex Branch era ended up with a life-long paddle steamer interest including Peter Lamb, Richard Clammer, Chris Phillips, Richard Green and me. All in all we have a lot for which to thank Mrs Pritchard and the 1960's PSPS Wessex Branch.